In a strange turn of events and a bit of good news, a photographer for News Corp, Brett Costello, working the 2016 Olympic Games in Rio came across the thief that had stolen his gear just a few days before, which you can read about here. The thief apparently had no shame, as he showed up at an Olympic event posing as Brett Costello. 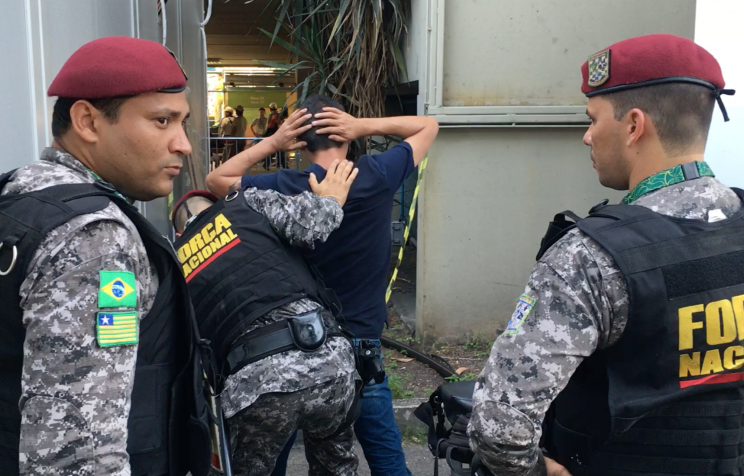 While photographing men’s archery at the Sambodromo stadium, it didn’t take long for Costello to notice the thief had on Costello’s photo vest, which was stolen along with $40,000 worth of camera equipment. The vest was obviously Costello’s, as it had the same media number, credentials and all. The thief was confronted by Costello, who had alerted security to the situation. Costello had his real credentials with him and as such, was able to prove that this man was falsifying his identity and potentially putting other photographers’ equipment at risk. Who knows what the man would have done had Costello not noticed him and been left to his devices and with full media area access. Given that he stole a bunch of expensive camera gear from Costello just a few days before, he could have easily been looking for another opportunity to relieve more photographers of their gear. Suspect being arrested. Photo courtesy of Yahoo Sports. Luckily Canon was nice enough to loan out some camera gear to Costello for the remainder of the Olympics so that he could do his job. The unfortunate thing though, is that it’s still very uncertain whether or not Costello will get any of his gear back. While it’s great that one of the thieves involved in the incident was caught, it still doesn’t mean that Costello will be able to retrieve what was stolen.